BRANDON, MB – Acclaimed artist Weiming Zhao is returning to his alma mater with a public exhibition of paintings at Brandon University (BU). The showing opened September 6 and will continue through mid-December. 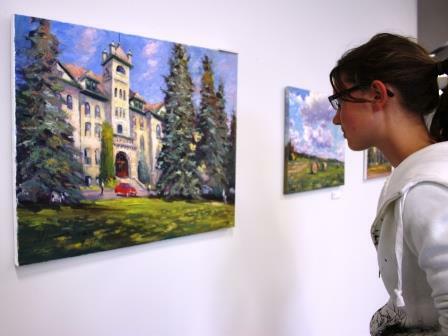 More than 40 of Zhao’s oils will be displayed in the Tommy McLeod Curve Gallery on the second floor of John E. Robbins Library at BU, including recent paintings from Riding Mountain, Brandon University campus, and other local landmarks. “It is my sincere hope that these images will conjure up a sense of home and a sense of home away from home,” says Zhao, who graduated from BU in the mid-1990s. Zhao, with 15 solo exhibitions to his credit, has created a portfolio of almost 4,000 paintings, in addition to teaching at the Art Gallery of Southwestern Manitoba and workshops. Art collectors across Canada, China, the United States, and Russia own his work, and six of his paintings recently have been purchased by Manitoba Culture, Heritage and Tourism for the provincial art collection. The Gallery is open seven days a week, except statutory holidays. For daily hours, go to http://www2.brandonu.ca/library/hours.html.